Jewelers Mutual Insurance Group invited jewelers enrolled in the Jewelerâ€™s CutÂ® LINK program to help support children in need over the recent holiday season. Jewelers Mutual pledged to make a donation for each item description submitted through LINK over the holiday season, with a goal to raise $10,000. Thanks to all the jewelers who participated, Jewelers Mutual raised $9,186 which is 92% of the $10,000 goal. The donation was delivered by Sheri Ihde, Director of Industry Relations for Jewelers Mutual and Jewelers for Children board member. â€œI am honored to be a part of such a wonderful charity and was thrilled to be able to deliver this donation,â€� said Ihde. â€œThousands of children have benefited from this organization and I canâ€™t begin to thank the jewelry industry enough for their support,â€� she added. 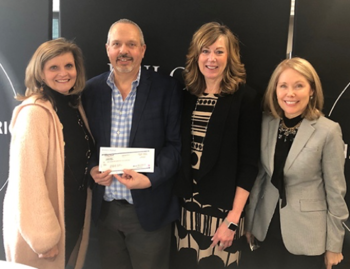 â€œThis campaign was such a great way for Jewelers Mutual and our jeweler clients to give back and thrive together,â€� said Mark Devereaux, Vice President of Sales at Jewelers Mutual. LINK is an exclusive program for jewelers that can help them grow their business. By participating, jewelers were able to enhance their customer relationships while simultaneously contributing to an industry-supported charity. To learn more or request to be part of LINK, contact the Jewelers Mutual program team at800-336-5642, ext. 2118 or jewelerprograms@jminsure.com.